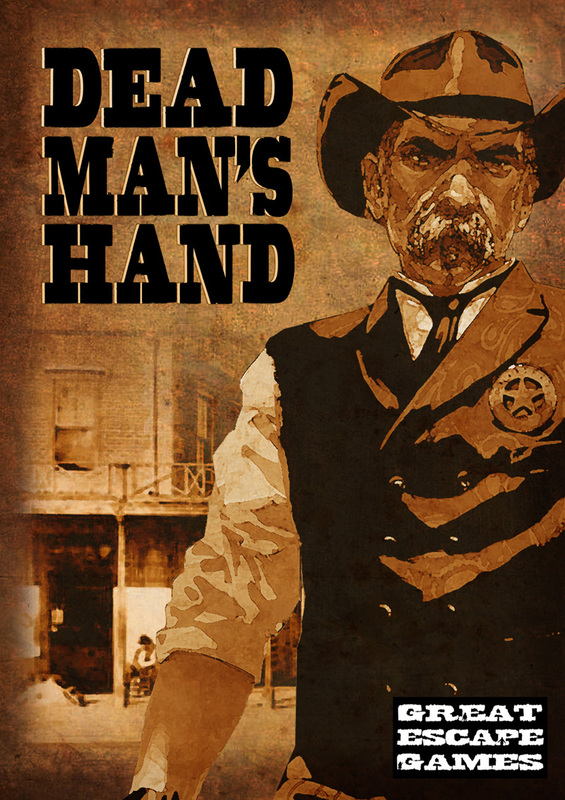 Now that I have some games under my belt of Dead Man's Hand I feel good enough to write a review of the game. I didn't post pictures of the games so far since I have not finished up the painting of the gangs just yet (the Desperado's are nearing completion). After reading the article on the game in Wargames Illustrated that goes through a game of DMH I was sold on picking up the rules. 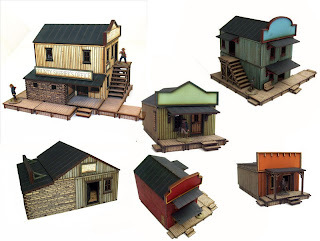 I had been eyeballing doing an Old West game before but there was really just Legends of the Old West by Warhammer Historical ... and well, I'm done with Games Workshop in many ways and not a particular fan of the rules system for many reasons. So I went big into DMH, since the cost of entry is not that much for me. Cost of entry is low, each gang really just being 7 guys and there being a total of 4 gangs to choose from (needing only two to play a game). The rules are well written, about 14 pages long with lots of pictures and diagrams. You can pick up the system very quickly. In conjunction with 4Ground, they supported the system with pre-painted buildings, making any gamer able to provide a nice looking table with functional terrain to play on. They also support the game with MDF markers, everything you need - yes, even a 10cm measuring stick which just about does it for everything in the game. I was shocked when I didn't have to go looking in my bin of measuring tapes and dice ... the rule book comes with the two dice you need (1 x d10 and 1 x D20), the cards, and the marker set has more than enough to play the game and measure the distances ... I had to pull nothing, it was all there from the beginning. Being a lover of Muskets & Tomahawks I've really come to love the cinematic style of rules being released these days. DMH really delivers on a old west experience that you grew up watching in Clint Eastwood movies and the likes. Crashing through windows and having a proper go at it ... just lots of fun (the game is enhanced with sound effects). The "scene" approach to providing a mini-linked set of scenarios for each game is brilliant (of course, each scene can be played as a stand alone game). Everything is driven by the deck of cards - which I think is a real innovation (not card driven mechanics, but the dual use of each card for activation or special rules). Each player has either the red cards (hearts and diamonds), or black cards (spades and clubs). The first 10 cards are the same for each suite, with the J-K being gang specific (you only use them if you are using that specific gang). The turn starts with each player flipping the top card of their (well shuffled) deck up. The higher card determines who has initiative (drawing a second card if tied). That card gets assigned to one of your gang members. Then each gang member gets a face down card. When everyone has a card you flip them all up and resolve them from highest card to lowest. Each player also starts with a hand of cards. Every card has a number value (used for resolving the turn order) and special rules. The cards in your hand are used for their special rules (which normally either help you during one of your activations, or interrupts your opponent by providing him some disadvantage to his actions). Each model gets three actions (move, shoot, recover, etc.). When all models have activated and completed their actions the turn is done. Rinse and repeat (reshuffling the discard pile when necessary to replenish your deck). That is the core of the system right there. No fiddling around with who stepped on a tac when scratching their arse in the 2pm sun while facing east and sneezing ... you get the drift. I have to say the models from their gangs are also very nice. Clean, well sculpted and easy to paint. They support the game with download of building signage, reference sheets, and additional "scenes" you can use to play once you've exhausted those included with the book. Buildings for DMH from 4Ground. It is fun, fast paced and easy to pickup quickly. With low cost of entry and stunning terrain how can you pass this by? how can you pass this by? 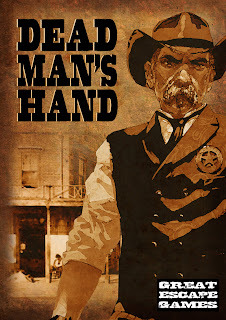 Its realy hard... but i myst admit I have a hard time coping with the initiative cards on the table as I realy don´t like stuff on the gaming table, but I might cope with this as cards and wild west are quite connected. Must find some one that have them and try them out i suppouse. Thanks for a great review Jay !!! Looking forward to heare more about the rules when you got some games played. Thanks for the review. I've been thinking about picking these rules up for a while and with the imminent release of The Kelly Gang...well, this review just sold me. Cheers. Awesome, that's great! I really can't say enough about DMH --- my group has had nothing but great fun playing it.